Has anyone ever seen the old Real video entitled “Kicked out of Everywhere”? It’s a classic skateboarding video that recently popped in my head on a recent road trip to a distant city. 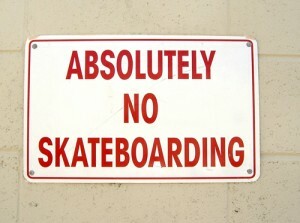 I swear, on a single day I was kicked out of 8 different skateboarding spots. And I am sure that’s a small number of times compared to what others go through. But seriously, it gets so frustrating when you travel to skateboard new terrain and you cant even session an empty parking lot. On one given situation, I opened my car door pulled out my skateboard and was beeped at and kicked out by a rent-a-cop on a segway. The dude looked straight out of the movie “Mall Cop” it was ridiculous. I also had to pull the old “look around trick” in which even though I’ve been kicked out, I stay ’til the dude leaves and commence to get in try after try all while watching my back every 3 seconds, which can get even more frustrating and make you loose focus on whatever your trying. Plus, the phrase “why don’t you go skate the skatepark”, popped out of half of everyone’s mouth kicking us out. Skateparks are great and all but they can get tiring quick and there is nothing like the feeling you get skateboarding raw street spots. Posted by Ruben 'Studdard' Najera	on Thursday, June 11th, 2009	in Skateboarding. -Salt Lake City to Ban Backyard Mini Ramps? whats wrong with skating spots. seriously. all the good spots have been taken away by the man.